Colin Maddocks - First rider over the Gap, Col loved the speed and the challenges of the journey. Member of the 'Group 6' echelon. Ian Windsor - Sunny Coast ex ruggerbugger, who fueled up on coffee before he tore up the track. Another 'Group 6' member. Vearney Frost - Toowoomba lady who is out there to make a difference. 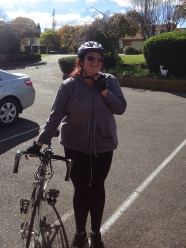 Alanah - Second time around for this Sydney based brain tumor professional. Crossed the line again on a mountain bike. Member of the 'Three Sisters' ride formation. Call sign - Big Sister. Jess Syne - True action girl that has gone on to kite surfing from Australia to Papua New Guinea. Showed us all how to take GoPro videos. 'Group 6' member. Christine Smith - Deepwater lass that refuses to ride on any event under 500km. Member of the 'Three Sisters'. Call sign - Little Sister. Scotty MacDonald - An aero engineer that burns up track to relax. This man was a weapon on two wheels. 'Group 6' member. Mark Driver, Consistent fronter who loves the journey. Member of the 'Three Sisters'. Call sign - Weak Sister. The skipper, leading his second B2B, Randal Bishop was unflappable.